Japan is publishing some economic data such as BOJ Policy Rate, BOJ Outlook Report and Monetary Policy Statement along with the US releasing Natural Gas Storage, Pending Home Sales and Prelim Wholesale Inventories. 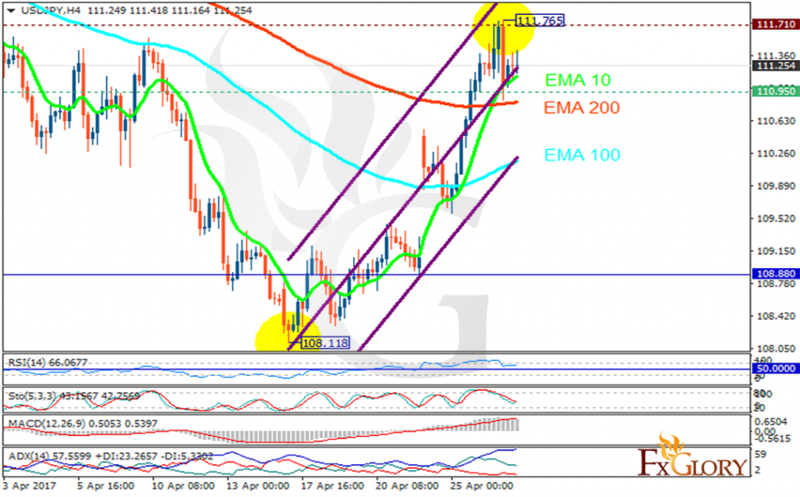 The support rests at 110.950 with resistance at 111.710 which both lines are above the weekly pivot point at 108.880. The EMA of 10 is moving with bullish bias along the ascendant channel and it is above the EMA of 200 and the EMA of 100. The RSI is moving horizontally in the overbought area, the Stochastic is moving in middle ranges and the MACD indicator is in positive territory. The ADX is showing buy signals.